I mentioned in my first post about cake decorating that I would do a follow-up about the other two classes in the first course. The third class was all about flowers. We learned a TON. We did drop flowers, swirl drop flowers, rosettes, shaggy mums, and pull-out pokey flowers (I forget the name). We also learned three types of leaves and how to do shells. And we learned how to ice cupcakes with that swirly look that you see at Publix. Needless to say, it was a very busy class that led to a lot of practicing during the week for me! 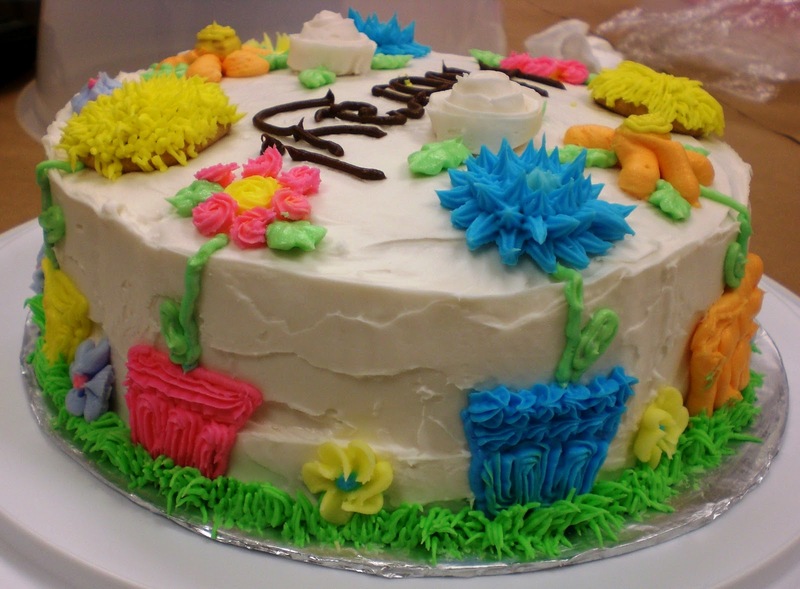 For the final class, we needed to bake, fill, and ice a cake, prepare a "cake plan," and bring any flowers that we wanted to use that needed to be transferred (as opposed to made directly on the cake). We also had a great deal of icing to make, in various consistencies and colors. This is where I struggled the most... in weeks 2 and 3, it took me a long time to make the frostings because I was doing it by hand. In week 4, I had a hand mixer (though it's pretty crummy, at least I didn't have to take breaks in order to finish mixing! ), but had a difficult time deciding when "thin" became "medium" and "medium" became "stiff." I agonized over this way too much, and quickly realized that it's much easier to make frosting thinner than it is to make it stiffer. Additionally, I think I struggled because I was changing recipes a bit. I mentioned last time that I didn't care for the sweetness of the class icing, so for week 3, I used Buddy Valastro's (from Cake Boss and Kitchen Boss) buttercream recipe. It was pretty easy to work with. But, the shelf life is shorter (it's made with butter rather than shortening), so I didn't want to make it again for week 4, and I went with a store-bought icing and class-recipe icing instead. Store-bought icing is ridiculously difficult to change the consistency of, because it seems to get thinner with each stir, regardless of what you're adding in. So, note to self, plain frosting can be done with store-bought, but decorations really need to be from scratch. Anyway, I thought about my "cake design" multiple times throughout the week... in the shower, while watching tv, falling asleep at night... and I just kept coming back to an idea that I found on a website, but modifying it to incorporate what we learned in class. So, after much deliberation, I went with it. I made four large flowers ahead of time, and a whole bunch of small accent flowers (many more than I needed, it turned out). I also used our favorite recipe and did a layered cake my way, instead of how we learned to do it in class. I did level my layers with a cake leveler, and that did help quite a bit. But I still honestly think that I got more height using three pans instead of one. And then I made my only real mistake. I forgot to add meringue powder to the thin consistency I used to frost the cake. This meant that, when I went to smooth out the top later, the top layer of icing pulled off the cake... forcing me to re-ice the top, and give up the idea of smoothing the sides via waxed paper. No biggie, though I was a bit sad that I wasn't going to have a really smooth cake to work with in class. It took some finagling, but I came up with a way to transport my ready-made flowers... inside my brownie pan that has a lid with handles. 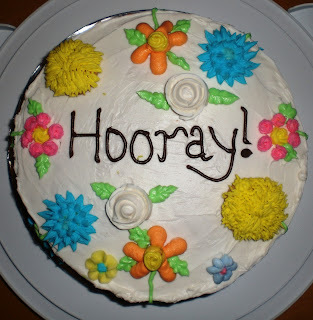 I just put all of my decorations on a cake circle (so I could get them out again), cut the edges of the circle so it'd fit in my pan, and slid the pan up on my arm so I'd be able to carry everything else. The first part of class was devoted to writing in print and script with icing, which was fairly easy for me. Then, we learned to make ribbon-roses, and spent half an hour or so working on those. They were difficult, and they're definitely a flower that I need to spend some more time practicing. I also think that my frosting could've been a bit stiffer, even though I saturated it with powdered sugar the night before to ensure tat it would be super-stiff. Again, this may be one of those times where, if you didn't get it stiff from scratch, you just buy stiff at the store in order to be sure it's the right consistency. Then, it was time to start our "finals." Because of where people sat this time, I didn't have any of the stronger decorators near me, which I was a little sad about. Instead, I had two girls to my right who were doing basic pattern transfers, and the woman to my left focused on simple borders and just a message in the center of her cake. I could tell that, across the room, more detailed cakes were being made. And that was good, because mine was fairly detailed. 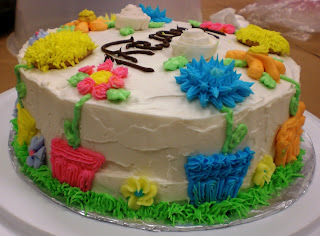 As you'll see in my photos, I did eight flowers around the top edge of my cake, alternating types between my favorites. I did "Hooray!" as my message because I wanted something simple, yet I still wanted to showcase writing. Then, I began outlining the flower pots on the sides of my cake, coordinating the colors with the flowers above each of them. As I began filling them in, the instructor realized what I was doing and came over to watch for a bit (she had been circling the room before that). She made some positive comments (which was encouraging), and I moved on to drawing stems and leaves. 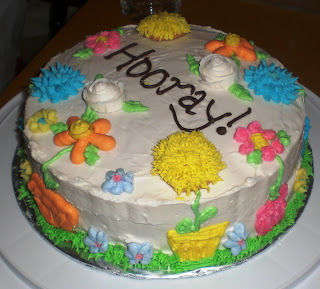 I added a grass border, and then transferred two roses onto the cake, adding leaves for them as well. I finished by placing some of my drop flowers on the sides and top, but ultimately only used about 1/4 of the ones I made, since the cake was looking pretty "busy." Apparently, in my head, an eight-inch cake is a lot larger than it is in real life, LoL. And, looking forward, I am planning to take two more courses (one specializing in more flowers and one dealing with fondant and gum paste), but not for a bit. I'm going to wait until the classes are on-sale again, and I'm also not sure when I'll be able to commit to a class for 4 weeks again. Plus, I need to pick a new location (I'm not the only person who wants to switch, either. I know of at least one other girl in my class who is planning to continue elsewhere). Wow, what a beautiful "final". It would make a perfect Easter cake. I definitely hope you take more classes because I look forward to reading about them!